Built in the early years of Emperor Qianlong Period in the Qing Dynasty, Suzhou Crane and Pine Tower Restaurant has a history of over 2,700 years and is a Suzhou style restaurant with a long history and enjoying great reputation both at home and abroad. The Crane and Pine Tower Restaurant is a “China Time-honored Brand” for catering identified by China Ministry of Commerce. 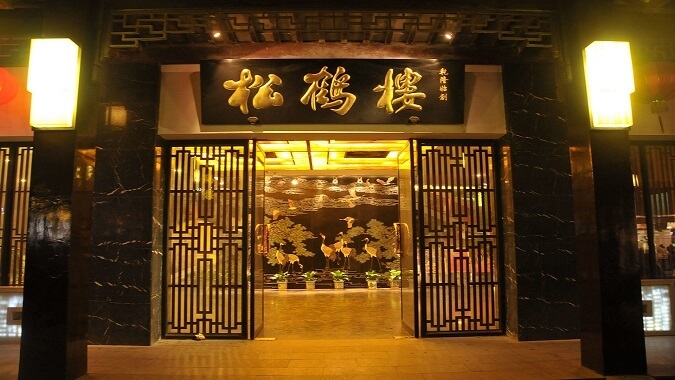 To some extent, it represents Suzhou cate and is also one of China’s top three restaurants. Now it has 22 chain restaurants distributed in such cities as Suzhou, Beijing, Shanghai and Ningbo etc. It is located at the world cultural heritage — Pingjiang Historical Block. Pingjiang Road is an epitome of the thousand-year old Gusu ancient city, Pingjiang Historical Block is a refined cultural garden, with small bridges, flowing water, households, ancient residences, ancient bridges and wells forming the particular historical and cultural elements for Pingjiang Road. Located at Suzhou featured traditional thousand-year old street — Shantang Street, the antique building itself is a scenic spot at Shangtang Street Scenic Area. With small bridges over flowing water and the hot sounds of the city, when sitting in the restaurant, it seems that you have walked into the times of the Ming and Qing Dynasties. At the bank along the old grand canal, there are row upon row of modern buildings. The history sense and the modern sense co-exist in harmony here, when you taste the refined dishes at the hundred-year old restaurant, what you enjoy is the fashion of modern Suzhou. Located at the bank of the beautiful Golden Roster Lake, it owns the prosperous and convenient CBD quality life circle in the east of the lake, enjoys all the elegant art atmosphere of the technology and culture center, and is a lustrous and brilliant pearl inlaid at the technology and culture center. It is one of the head dishes among Suzhou style dishes originated from The No. 1 Mountain of China and The No.1 Spring of China from Jiangsu landscape. It is cooked by matching golden yellow rice crust with the full and elastic shrimp meat supplemented by chicken slice and tomato, so it is bright in color and tempting. It has nice looking, sound and taste as the chicken, shrimp and mushroom are very delicious, the tomato is bright in color, the rice crust is savory with crispy sound. At the banquet in the area of Jiangsu, it is often ordered as a hot dish, so it is called as The No. 1 dish of China and also called as “A Sudden Clap of Thunder”. 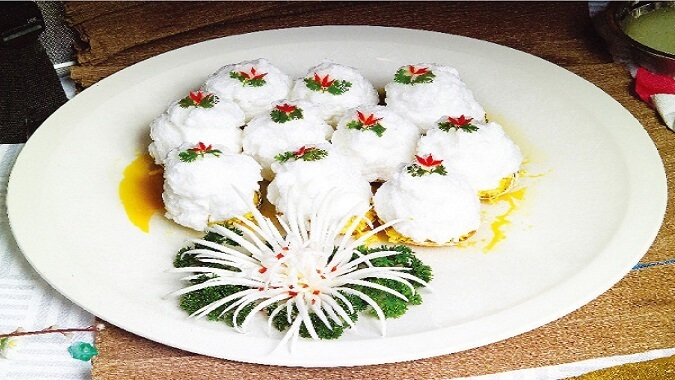 As a famous dish in The Crane and Pine Tower Restaurant, it is white as snow with fresh crab meat, and the color, smell and shape are all available. With the crab shell as the container, this dish is filled with fried crab meat which is covered by egg, then matched with ham etc., and it is bright and pleasing to the eye. Taiji White Jade Soup is cooked by using China’s traditional “Taiji” concept. 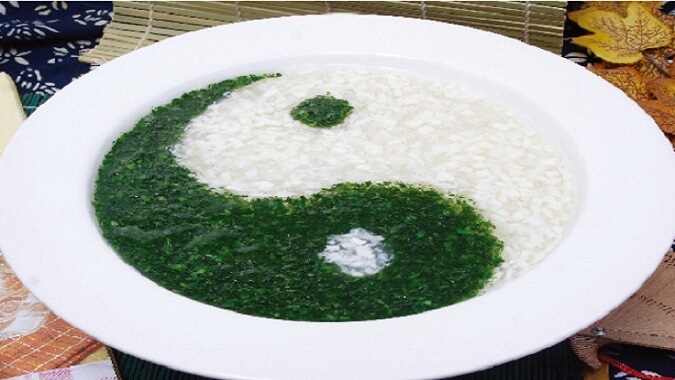 First, cut the green shepherd’s purse and the tender bean curd into pieces to cook soup, then make a Taiji shape, the traditional Taiji diagram is put onto table creatively, bringing people a very profound historic sense, while the bright colored dish also makes people feel fresh and simple but elegant. It’s the Chinese intelligence to taste this dish, and also to experience the ancient philosophy of China. 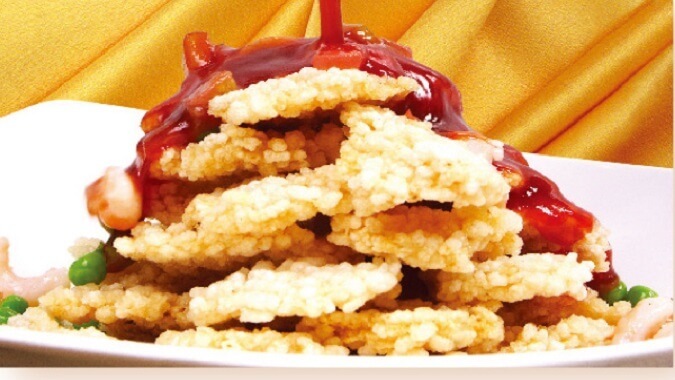 Besides, Suzhou Crane and Pine Tower Restaurant also provides such very famous Suzhou style dishes as the sweet and sour mandarin fish, Gusu boiled duck with spices, braised ham in honey sauce and oil fried eel paste etc. to guests.